It was a breezy day and this morning there was a lot of wing flapping and jumping by two of the youngsters. One of them (Black 28/Blue Z) made a bold jump to the City Centre Building next door in the early afternoon. Kudos to neighbor Nick for spotting her strolling along the roof. She stayed there all afternoon and into the evening. Let’s hope the next flight for our brave young bird is also successful. One of the other chicks spent most of the day on the parapet. 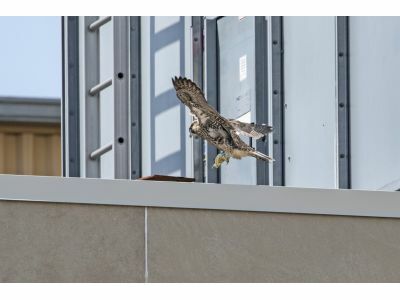 We did get a report from an observer in the building that all three chicks were seen either on the parapet ledge or in the window well where they have been hanging out after they discovered how much fun it was to jump into the window well and walk up the ramp. Both parents stayed very close to home base all day and kept the youngsters well fed and supervised. Look for a change in the cameras. Because the chicks are not in the box very much, I have asked to discontinue live streaming of the nest camera and switch to live stream for the parapet camera. Look for that option to pop up in the main menu and you will be able to watch the parapet cam without the delay.